What happens when you combine trained musicians from the world-renowned Berklee School of Music in Boston, with an articulate emcee and breathtaking beat-wizard both born and raised in sunny, southern California? Crown City Rockers, that's what! A genre-blending hip-hop sollective, whose music is original, powerful and provocative all in the same breath, and follows in the storied footsteps of such pioneers as The Roots, De La Soul and Tribe Called Quest. With an organic blend of lush, funk-drenched grooves, riveting classic soul samples, sharp live instrumentation and of course old-school inflected rhymes, Crown City Rockers is a welcome breath of fresh air in today's commercially cluttered hip-hop cosmos. 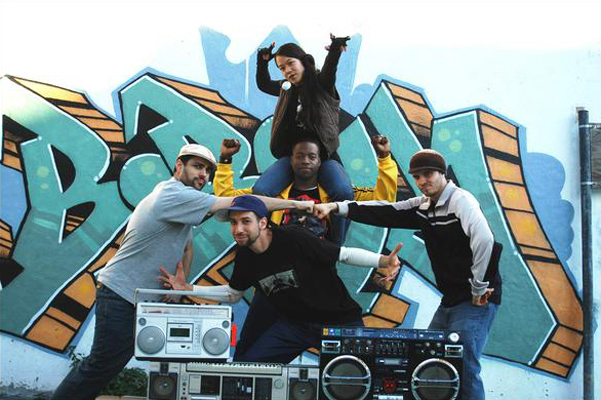 Comprised of stellar emcee Raashan Ahmad, producer Woodstock, keyboardist Kat Ouano, bassist/producer Headnodic, and drummer Max MacVeety, Crown City Rockers formed in Boston's Roxbury section during the late nineties. "We did some shows in Boston trying to get our name out," recounts Raashan. "And then we decided to move out to Cali to record an album." And so, the group, then known as Mission, set out West. The trip to Cali proved to be an adventure in itself. An 18-wheeler totaled all of the group's instruments and the car they were driving. Once the group finally made it out west, they used the insurance money from the accident to put out a self-titled EP to get their name out. Soon after came their first full-length, called One. The album quickly established the group as a subterranean stalwart in the Bay Area, where they were now located. After that, the group, who changed their name to Crown City Rockers after Mission UK, (an old 60's British rock band) asked them to switch monikers. Now, the Crown City Rockers', with undeniable talents and distinct musical backgrounds this group is certain to make an immediate impact on those who are privileged to witness a performance. Crown City Rockers' music speaks for itself, and dares you not to listen.